I can’t remember ever buying a new rug kit. All my rugs are either self-designed or second hand. The second hand rugs have ranged from unused complete rug kits to partly completed projects or to printed canvases with no yarn. Latch-hooking is pretty simple, but many people buy (or are given) a rug kit and never complete it. They may decide rug-making isn't for them (personally I can spend a whole winter's day latch-hooking). They may get bored at the slow progress of the pattern. 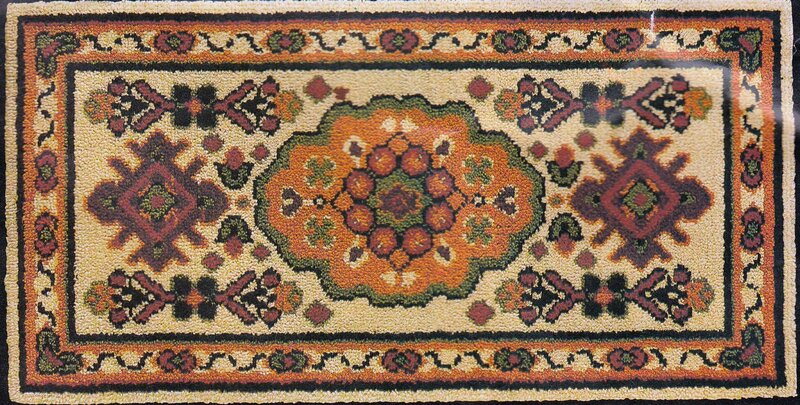 Rug-making used to be an occupational therapy for long-stay hospital patients who found it only marginally les boring than doing nothing. Other interests may have left a person with no time for complete a project. 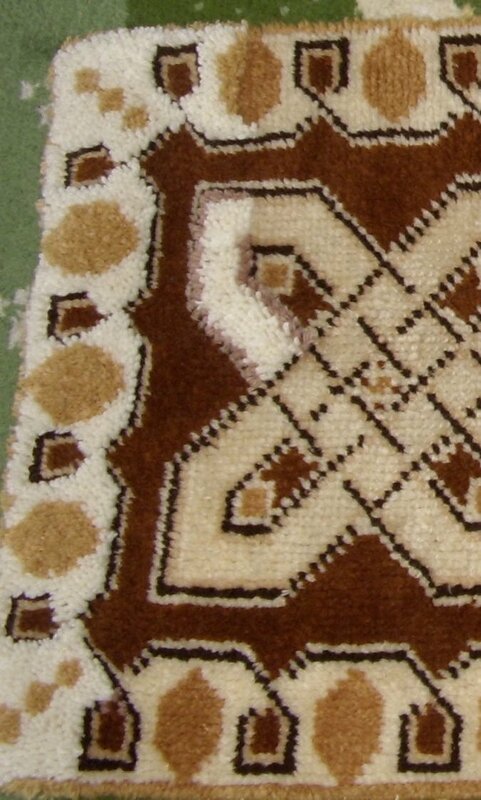 Incomplete rug-kits turn up in charity shops, boot fairs, jumble sales or online auction sites. I think Oxfam once sent all their Readicut donations to Chelmsford because they were being snapped up so fast (that would be me!). There are plenty of second hand rug kits out there and you can pick up some really good bargains. Some are completely unused (probably unwanted gifts), some are partly done (probably the person got bored, or got in a muddle and gave up) and some are incomplete kits or canvas only. It’s amazing what people find when clearing out houses or their lofts. I’ve seen unused vintage complete Readicut kits sell online for upwards of £150, while stencilled canvases can fetch £80. If buying vintage cut packs of wool online, check how many strands are in the packs (160? 320? 340?) as this affects the price. If you’re buying via online auction, read exactly what you are bidding for so you won’t be disappointed when it arrives. These same items are cheaper, but less common, in charity shops and boot fairs. 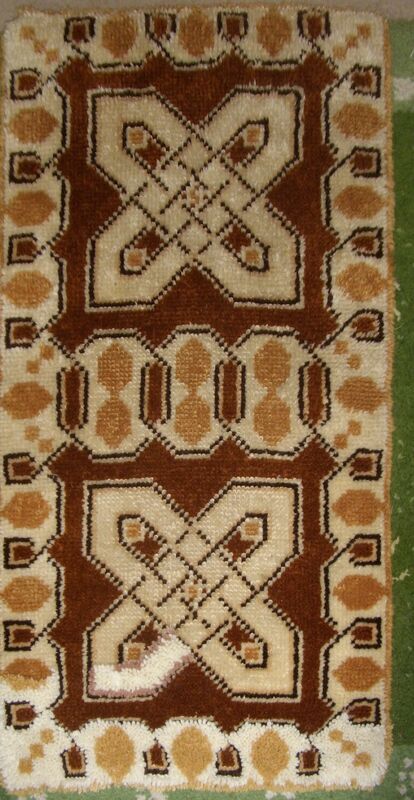 Some of these secondhand rug kits may need rework to undo the previous owner’s muddle or to add your own design elements such as a border motif on a plain rug. 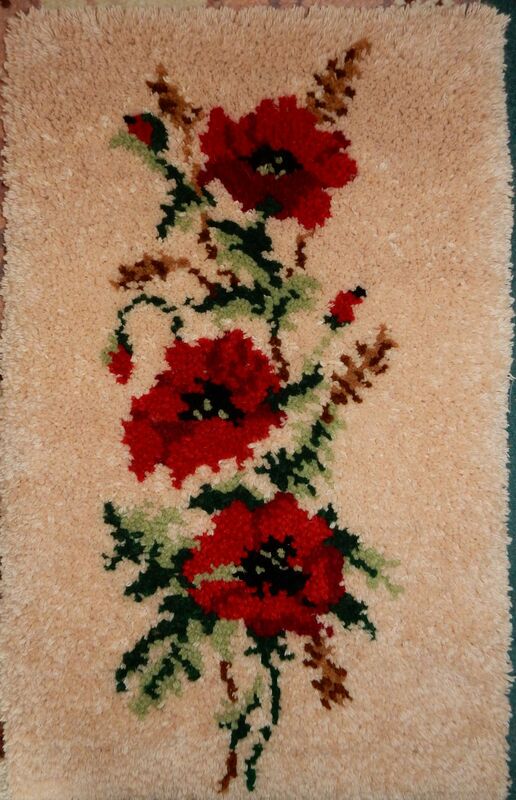 I’ve made latch hook rugs for over 30 years and haven’t yet found one I couldn’t fix, but not everyone wants the challenge of unpicking messed-up work, improvising an unclear/faded pattern or repairing a canvas. Readicut: Teheran - bought half finished. I've sometimes had to partly unpick some truly badly made rugs, but the effort was worth it so I could reuse the canvas and, if possible, the yarn. Sometimes the canvas itself is damaged with the threads pulled all over the place. This makes rework slow going and there's a risk of a slightly misshapen rug, but if you're careful it's worth it. A hole or cut in the canvas is surmountable as long as you patch it with a much larger piece on the underside so there is plenty of overlap (you may need to unpick part of the pattern - if so, make a squared chart so you can easily restore that section). On the underside, I stitch the edges of the patch to the hole; on the upper side I stitch the edge of the hole to the patch, to prevent fraying (this is best left to a latch-hook enthusiast who knows how canvas behaves, rather than to a novice). One great thing about latch-hooked rugs is that sections can be unpicked and reworked if the previous owner has made a hash of things or if there's a stain. The problem is, if there's no wool and the colour can't be matched from modern ranges, you may need to unpick a whole colour throughout the rug to avoid a mismatch. I’m reworking a rug inch by inch by unpicking sections and replacing them with new wool. It’s satisfying to see the new, fresh colours creep further and further along the rug. The difference in pile between the pure wool and the worn and rough wool/acrylic mix is very marked. Firstly, is yarn included? Is it thick or thin yarn? Acrylic, mixed fibres or pure wool? Is it the right thickness for the holes per inch of the canvas? Is there enough yarn to complete the kit? Dye lots change over the years – not an insurmountable problem, but you’ll need some additional wool if there isn’t enough in the kit. If the kit comes with all its paperwork, it will probably tell you how many packs of each colour yarn you need. Modern packs of 6 ply yarn are standardised at 160 strands, but classic packs (Blue Fez, Readicut etc) were 320 – 330 pieces depending on brand (so you’ll need twice as many modern Anchor/Iriss cut packs). You’ll have to do some calculations if the rug is part worked. For 3.3hpi canvas, a pack of 160 strands will cover an area 13 × 13 holes (almost 4 x 4 inches). A vintage pack of 320-330 strands will cover almost 18 × 18 holes ( 5.5 × 5.5 inches). Older kits give the quantity by weight of the supplier’s own brand of wool (in pounds and ounces). Because wool weights differ according to thickness and blend of fibres, this will only give a rough guide unless you can get hold of the original yarn type e.g. Patons Turkey skeins. If there is isn’t enough of a particular colour, you’ll need to find the closest match and mix the strands together. The exact end result depends on the ratio of one shade to the other, but from a distance the shade will look even. Alternatively, a 1-to-1 mix of quite different colours will give a stippled area rather than a solid area. Or you could work the area in a different colour altogether if you have enough yarn stored away. I have a large stash of green rug wool so I’ll be working a traditionally blue willow pattern (from a Patons chart) in shades of green. Is the canvas plain or stencilled? If it’s plain, does the kit come with a pattern chart? If it has guide squares, check if these are 8 x 8 holes or 10 x 10 holes. This doesn’t affect the quality of th canvas, but if you want to work a 10 hole pattern on 8 hole canvas (or vice versa) you’ll need to ignore the coloured guide threads. Is the canvas in good condition or is it damaged? Will you need to patch it? Canvases aren’t hard to repair, but it depends on whether you want to repair it. 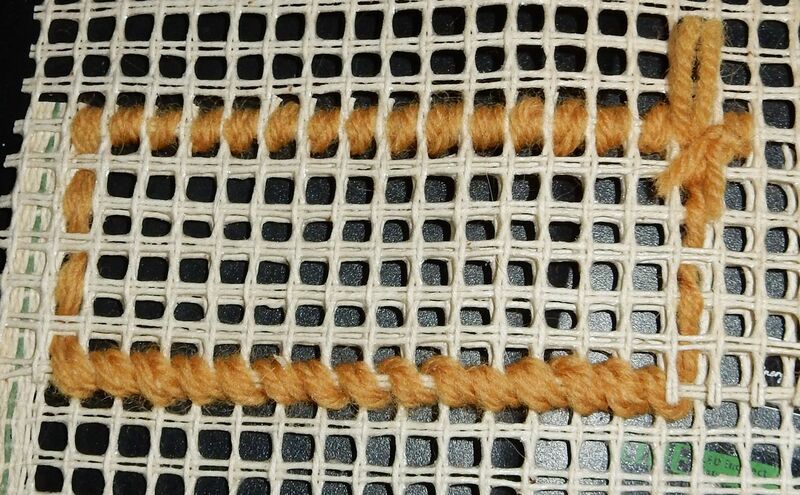 If the threads are distorted (pulled one way or another) this isn’t hard to accommodate as you work as the knots should push the canvas threads back to where they should be. If the canvas has a hole in it, you will need to patch it – again, not hard, but time consuming. Each knot is an individual strand of yarn, which makes it feasible – if fiddly – to repair a damaged latch hook rug. If it’s only the pile that is damaged, you will need to unpick the knots and replace them a few at a time. If you don’t have wool the same colour, you’ll need to unpick a larger area of that colour and create a stippled (spotted) pattern, not only in that area, but in other areas of the same colour. That way you’ll reclaim enough strands of the original colour to help repair the damaged area. You could, if you want, replace the area with a whole different colour if it doesn’t adversely affect the pattern. Repairing the canvas is a bit more complicated. It’s not uncommon for a poorly bound canvas to become damaged at the edge. That means grafting a new bit of canvas on top of the damaged area. Before you unpick the yarn from the damaged area, you need to transfer the pattern onto squared paper. Take the pattern from the reverse side of the rug, where it’s easier to see, and colour code it onto squared paper. Alternatively, take a photo of the back of the rug. Either way, make a mirror-image the paper chart/photo (using a scanner or transferring by hand) to give you the pattern chart for reworking that area. Whipping a section of canvas on top of another to repair a hole . Make sure the patch has the same number of holes per inch as the damaged canvas. Then unpick the damaged area, and the surrounding area to about 1 inch/3 cm of canvas (adjust your paper chart if necessary). That extra 1 inch gives you a solid foundation for attaching the patch. The patch must be larger than the damaged area so you can secure it to the solid foundation. If it’s on the edge of the canvas and doesn’t have a selvedge, hem it to prevent it fraying in the future. Place the patch over the hole and whip it (stitch it) to the solid area around the damage. Make sure the holes line up properly. Now refer to your pattern and replace the knots. Some knots must now go through 2 layers of canvas to secure the patch to the base. There are plenty of part-worked canvases around, but these vary in quality and can be frustrating if the original person made a mess of things. If the original owner has made a mess of the colours, you’ll need to selectively unpick areas and rework them, otherwise you’ll run out of wool and the pattern won’t look right. I’ve finished some very good part-worked canvases, but I’ve also had to completely unpick one where the original owner had inserted knots that spanned two squares. The canvas threads were horribly distorted, but the canvas was salvageable, albeit as a slow and careful job. Some folks either can’t, or don’t, follow patterns so you need to selectively unpick sections. You’ll also come across part-worked canvases where the interesting coloured bits have been selectively worked, but it proved too fiddly or boring to work the background. Often the canvas will have been pulled out of shape making it fiddly to work the background around the pre-worked areas. Personally I enjoy the challenge of fixing these things, but it’s not for everyone. It takes some effort to get the canvas back to its original shape. Soaking the canvas, in sizing solution if possible, stapling it to a frame and straightening the threads before it dries is a radical, but often effective solution if you have my sort of ”waste not, want not” philosophy. The easiest way to size (stiffen and glue) a canvas once you’ve pushed the threads back into alignment is to use watered down paint. Once it’s dried, you could paint a pattern onto your now plain the canvas. The other common sizing solution is laundry starch powder made up with boiling water and then thinned using cold water (the pack should have instructions). This is best done on a sunny day as the sizing solution dries faster. Unlike paint, this won’t obscure the original stencilled pattern. Wallpaper paste might work, though I haven’t tried it myself. The colours on an unworked canvas fade at different rates. Before starting work, look at the canvas in daylight or under a daylight bulb. If necessary, use a permanent marker to re-colour faded areas; this will be hidden when the rug is knotted. It helps to have a picture of the finished pattern e.g. from the catalogue or paperwork accompanying the kit, or from an online resource. Bonanza.com is a good resource for old Readicut charts. 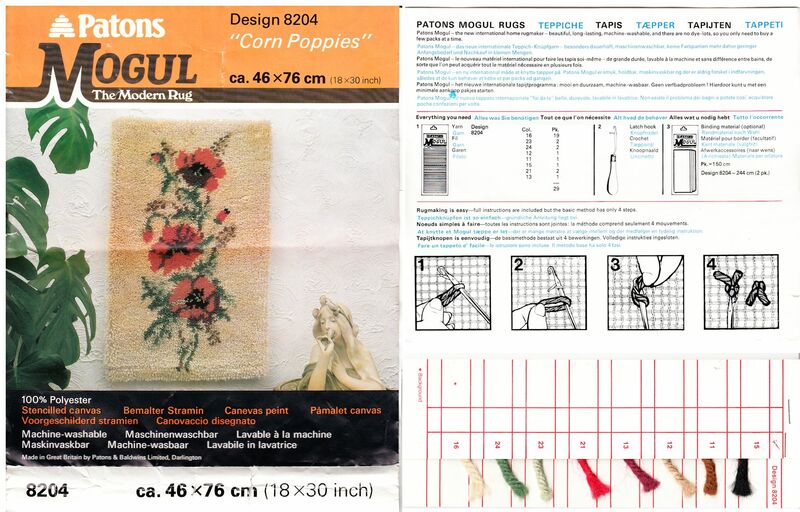 If you have a faded canvas without yarn, you could always flip the canvas and use the unstencilled side for your own pattern. This is a Patons rug kit I found secondhand without any yarn. I used their yarn guide to find near matches from my stash. I bought the canvas without any yarn. Instead of Patons Mogul (100% acrylic) I used yarns from my hoard, mostly pure wool Readicut and Bairnswear Blue Fez for the background with some wool/acrylic mix Readicut for the colours. 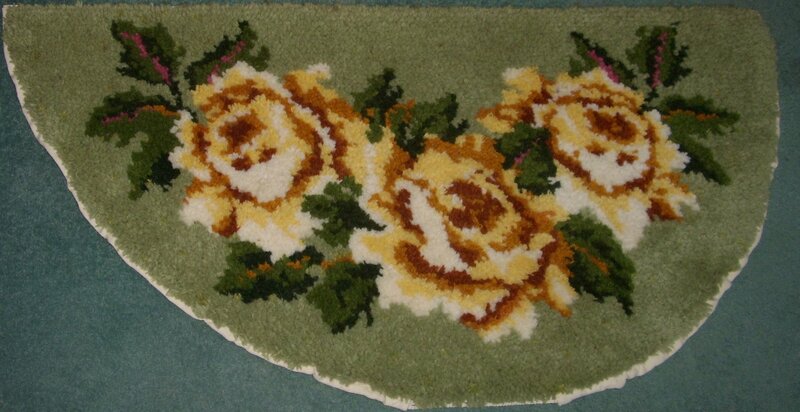 The yarn used was thicker than Mogul so this wall-hanging/small rug has an extra-deep pile.